Established in August 1999, BidorBuy is hugely popular as South Africa’s largest online marketplace. Set up in auction format, Bidorbuy.co.za is the top site to trade almost anything online. Over 700 ,000 items are listed for sale every month and the site continues to grow. BidorBuy has been helping South Africans locate the products they love at great prices for years and in addition to their “bid” or “buy now” selling format, they offer plenty of great deals and promotions. 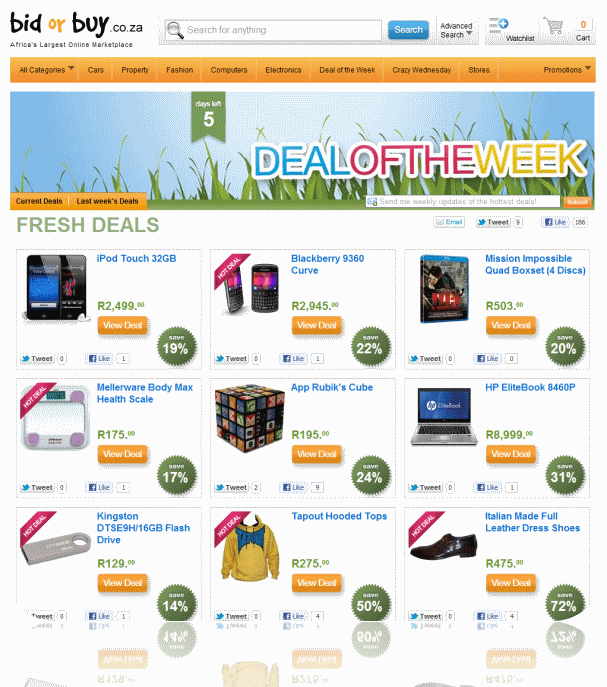 Bidorbuy features “Deals of The Week,” allowing buyers to cash in on discounts of up to 60% — with no bidding required! Every week, Bidorbuy customers can take advantage of 10+ new deals on premium products. One can expect to regularly find discounts averaging around 35% on electronics, accessories and clothing from top brands. Past “Deals of The Week” include products from Samsung, Nine West, Fossil, Yardley, Zoo York and Nikon. One week alone, two separate deals were offered from Apple on the iPhone and Macbook Air! Customers craving more can even email Bidorbuy directly to suggest products and deals they want to see featured. Look out for many ongoing promotions such as “Crazy Auctions,” “Weekend Special,” “Spring Clearance,” “All Snap Friday Auctions” and year-round holiday events. The “All Snap Friday Auctions,” for instance, open every Friday from 9h00-14h00 with an R1 starting bid and no reserve limits on any of the selected items. Bidorbuy additionally hosts several charity auctions allowing customers to donate to their favorite charities with every purchase. Having served the South African community for over a decade, the site is fast, easy to use and offers customers a variety of features including a convenient watchlist to store potential buys, a simple and secure shopping cart for purchases, a messaging center, blog and forum. Live chat, phone and email assistance, as well as helpful information pages make the site`s customer service unbeatable. Moreover, bidders and buyers wanting to stay in the loop can set up SMS alerts or visit the Bidorbuy mobile site. Remember UbuntuDeal, who was written about here a few months ago? BidorBuy.co.za acquired the deal site in April 2011. Thanks to this great teamup, South Africans can expect to find similarly great weekly deals now on BidorBuy`s secure and well-known marketplace.